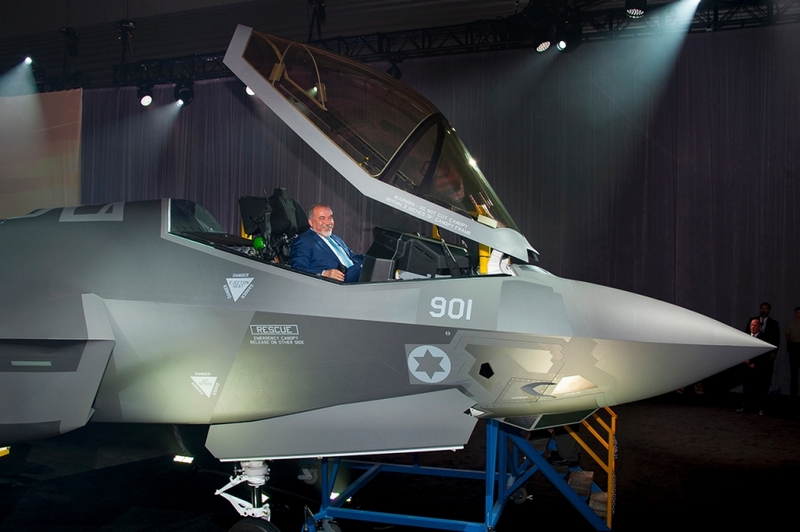 Full Frame: No F-35 For Singapore ... For Now .. And What's The Deal With Guam? No F-35 For Singapore ... For Now .. And What's The Deal With Guam? State Dinner : What's On The Menu? At the invitation of the President of the United States Barack Obama, Prime Minister of the Republic of Singapore Lee Hsien Loong made an official visit to the US to celebrate 50 years of diplomatic relations and to further enhance the bilateral strategic partnership that the two countries had enjoyed so far. The state visit had taken place from 31 July to 5th August 2016. The two leaders had many things to discuss, from boosting trade and commerce links to strengthening people-to-people ties through exchange scholarships and implementation of trusted traveler programs, addressing regional and global challenges including climate change, global terrorism, freedom of navigation, and last but not least, enhancing security and defense cooperation. 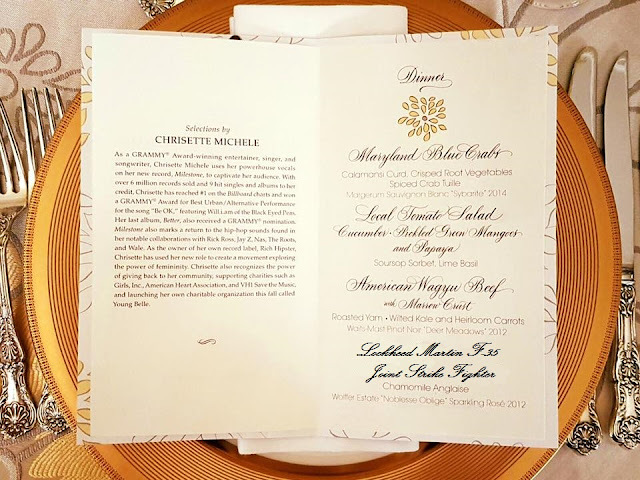 A state dinner at the White House was also hosted in Singapore's honor on 2nd Aug 2016, the 11th so far by the Obama Administration in his eight years in office. Singapore was the fifth Asian country to receive this honor, after India, China, Japan and South Korea. During the black tie event attended by 200 prominent guests including Vice President Joe Biden, Secretary of State John Kerry and Secretary of Defense Ash Carter. 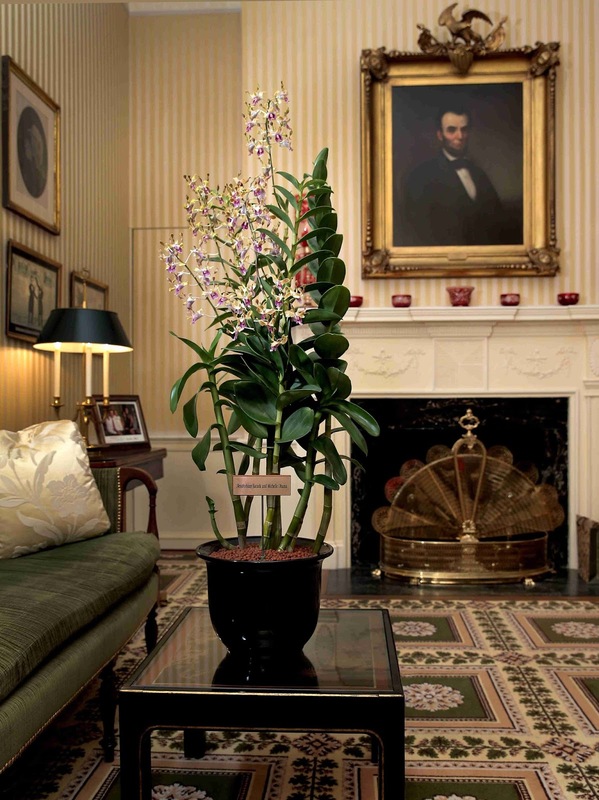 PM Lee returned the honor by unveiling a Singapore cultivated orchid hybrid named after the US President and the First Lady, Dendrobium Barack and Michelle Obama, to mark the 50th anniversary of bilateral relations. It is a cross between a hybrid native to Hawaii where Mr. Obama was born, the D. Pink Lips, and a Singapore hybrid known as D. Sunplaza Park. 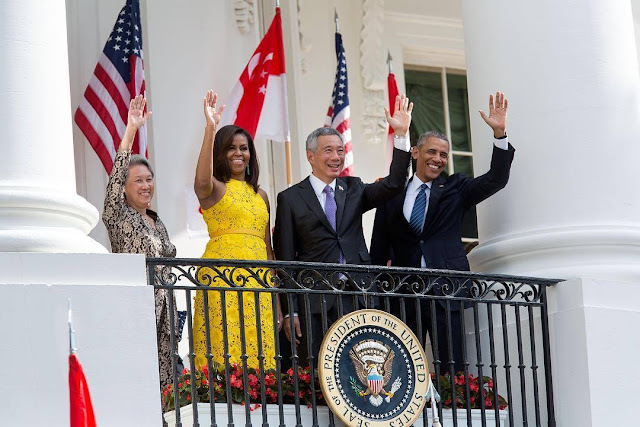 bilateral relations between the US and Singapore. With bilateral ties at an all time high, as they should be, and knowing that Singapore has been interested in the F-35 Joint Strike Fighter for the longest time yet is always in no hurry to make the final decision, the question that many will ask is, was the F-35 on the State Dinner menu? Could a possible F-35 foreign military sale ( FMS ) to Singapore be Obama's last hurrah in his lame duck period? As usual, some background information to provide the reader with the right perspective is always appropriate. and Lockheed Martin F-35 Joint Strike Fighter?! Fifty one years ago, on 9th Aug 1965, the tiny South East Asian nation of Singapore was born in anguish, having been unceremoniously kicked out of the Federation of Malaysia like an unwanted child. Before that, it had been a British crown colony since 1819, until it achieved self-governance in 1959 and subsequently joined the Malaysian Federation in 1963. As a small island nation without natural resources and at that time surrounded by potentially hostile neighbours, Singapore needed friends, and fast. Friends whom it could learn from, trade with, garner political support and who could lend a helping hand when it was needed. It was a matter of survival. And among the first few countries to recognize Singapore as a sovereign country after it declared its independence from the Federation of Malaysia was the good old United States of America under the leadership of President Lyndon B. Johnson. Official recognition came on 11th Aug 1965 in a letter from Secretary of State Dean Rusk to Singaporean Foreign Minister Sinnathamby Rajaratnam, essentially the day after independence, taking into consideration that the US lies across the International Date Line on the other side of the Pacific. The establishment of diplomatic relations and the American embassy came the following year, on 4th April 1966, with Richard H Donald as Chargé d’Affaires ad interim. The rest that followed, was half a century of ever deepening friendship and thrust, of mutual understanding, respect and admiration. Informal relations between the United States and Singapore had began even earlier, way back in the 19th century when US merchants engaged in the China trade began to visit the port on their way to and from China. As Singapore became one of the most important ports in the region, US-Singaporean interaction increased and the first American representative to Singapore, Joseph Balestier ( 1788 - 1858 ) was appointed on 4th July 1836 when the US established a consulate. He was a merchant and plantation owner whose wife Maria was the daughter of Paul Revere, silversmith, industrialist and Patriot in the American Revolution of the midnight ride fame. Their legacy endures in Singapore today, with an entire neighborhood, a high school and road named after Balestier. A beautiful church bell made in the foundry of her father was donated by Maria Balestier to the St Andrew's Church once signaled the evening curfew now rests in the Singapore History Gallery of the National Museum. 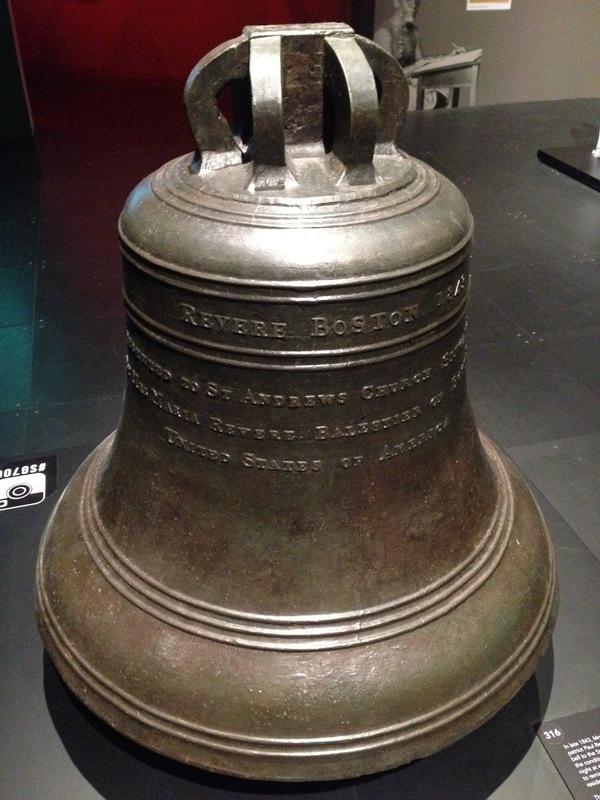 It is the only Revere bell outside the United States. The Revere Bell at the National Museum of Singapore. Inscription reads : Revere, Boston 1843. Today, the US is the biggest source of foreign direct investment in Singapore. Over 3700 US companies are located in Singapore and a growing number of Singapore companies are establishing themselves in the US. The US-Singapore Free Trade Agreement, the first such US agreement in Asia and now in its twelve year is a reference agreement that has shaped subsequent bilateral and multilateral FTAs in the region, including the high profile Trans-Pacific Partnership ( TPP ). Students from both countries study at each other's schools from elementary to post-graduate levels and beyond. The Singapore Armed Forces stations and trains approximately 1000 of its personnel annually in the US. Similarly, the US regularly deploys aircrafts and ships on a rotational basis to Singapore, contributing to the stability of the Asian Pacific region. The US$379 billion F-35 Joint Strike Fighter ( JSF ) program is without doubt the world's most expensive weapons program. It aims to produce a 5th generation multirole stealth fighter in three variants to replace a whole host of legacy fighters and attack aircrafts in the United States Air Force ( USAF ), United States Navy ( USN ), the United States Marine Corps ( USMC ) and some of its closest allies. The program's international partners includes the UK, Italy, the Netherlands, Australia, Canada, Denmark, Norway and Turkey. Israel and Singapore are Security Cooperative Participants. 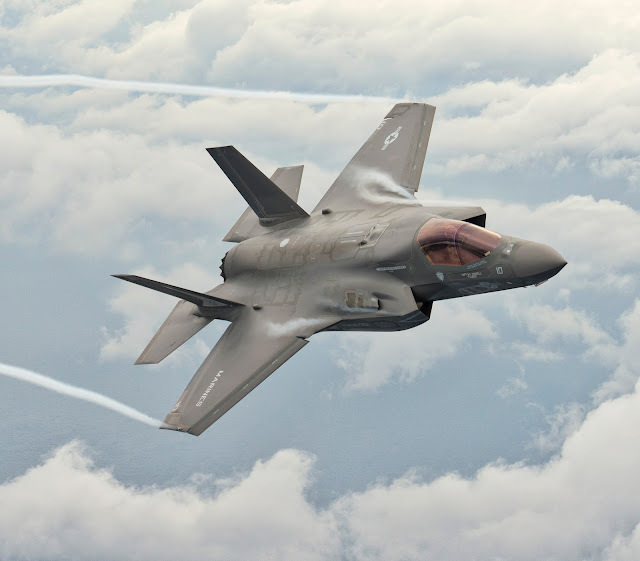 Apart from the United States, the F-35 to date has orders from eleven countries, including eight international partners and three foreign military sales to Israel, Japan and South Korea. The JSF program was highly controversial due to the multiple setbacks it encountered during its development, long delays and huge cost overruns. Early adopters saw the unit cost increase from an initial estimate of US$50 million per aircraft to more than $150 million, causing some to cut procurement numbers or postpone their purchase, which in turn leads to more upward pressure for the unit price. It is therefore the interest of the US as well as the F-35's vendor, Lockheed Martin, to secure as many orders as possible in order to bring down the unit cost of the volume production F-35 to a targeted $85 million by 2019. This can be achieved by enticing the early adopters to exercise their options for additional aircrafts, place follow-on orders ( like Israel ), and by convincing those potential customers who are still undecided to finally take the plunge ( like Singapore ). The best way to do it is to demonstrate that the F-35 works as or better than advertised and ironically, a drastic price cut itself! So did Obama attempt to get Singapore to commit itself to a squadron of F-35s? I'm sure he did. I would if I were Obama. After all, the Americans really have nothing to lose by asking and a whole lot to gain if Singapore had said yes. Listed below are some of the reasons why the time might now be mostly right for Singapore to finally own a couple of these stealth fighters. 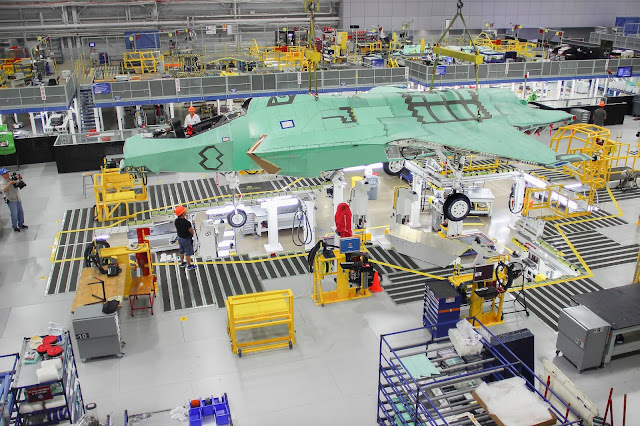 With the production of the F-22 Raptor permanently shutdown, the reality is that the F-35 currently is the only stealth fighter in production and available for export in the Western World. The F-22 was never cleared for export to any country, ever. So, unless you are a partner in Russia's PAK-FA stealth fighter program like India or are researching your own design like Japan and its Mitsubishi X-2 technological demonstrator, or plan to wait for China's FC-31 to be made available for export, you really have no other stealthy options apart from the A, B and C variants of the F-35. Like they say, simple as ABC. How to tell them apart physically? The F-35A conventional take-off and landing ( CTOL ) version for the USAF has a bulge over the left upper fuselage from its internal 25mm Gatling gun and a boom receptacle for aerial refueling at its dorsal area, two unique features which the other versions lack. 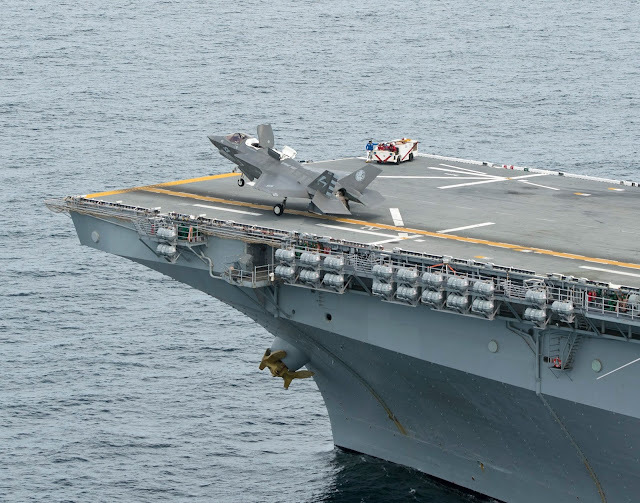 The F-35B short take-off and vertical landing ( STOVL ) version for the USMC meanwhile has a bulge behind the canopy to house the huge lift fan which also has distinctive panel lines. 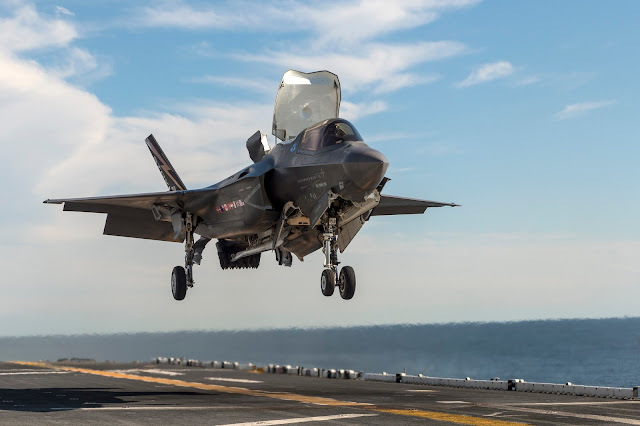 The F-35C catapult assisted take-off barrier arrested recovery ( CATOBAR ) version for the USN has a wingspan 8 feet longer than the other versions, a tailhook assembly and a double wheeled forward landing gear. 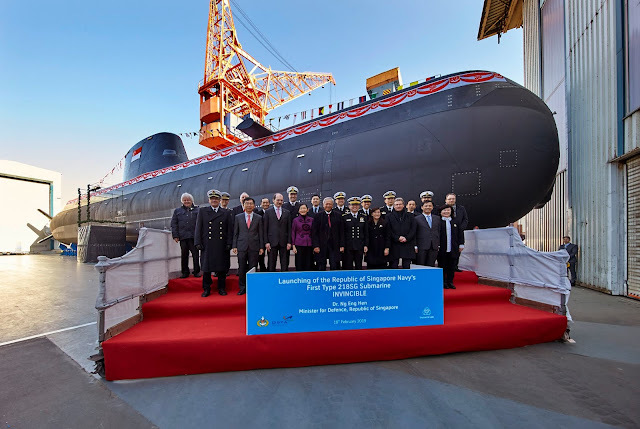 On 16th Mar 2004 Singapore signed a Letter of Offer and Acceptance ( LOA ) to became a Security Cooperative Participant ( SCP ) of the System Development and Demonstration Phase ( SDD ) of the JSF Program, the only Asian country to do so. It followed the signing of a Letter of Intent in Feb 2003 which laid down the broad principles for the SCP arrangement. And that seems like a looooong time ago, at least by aircraft standards. For $10 million, being a SCP allows a country to be able to have early access to proprietary information, including flight simulators. It allows early evaluation of the ability of the F-35 to meet the country's long term operational requirements for a stealth fighter. The SCP member country will have insights into the JSF’s development progress and be able to conduct studies for integration of its requirements into the JSF. It will also have the privilege of requesting for early purchase of the F-35 with deliveries from 2012 onwards. Of course those dates slipped badly and many partner countries are just beginning to receive their first F-35 this year. Now one wouldn't spend that kind of money unless seriously interested in the aircraft in question, right? The only other SCP of the JSF Program, Israel, had already put in an initial order for 33 F-35I Adir and possibly a follow-on order of another 17. If it is good enough for the Israeli Defense Force ( IDF ), it is good enough for the Singapore Armed Forces ( SAF ) ... well not exactly, but the two countries do have a long history of military cooperation and share many similar platforms and systems. That said, endorsement by the IDF does carry weight, in fact a lot of weight. The SAF had more than twelve years to do due diligence as a SCP, and SDD Phase which started in 2001 and originally projected to last for 10 years is already in its final stages and scheduled to end in 2017. Time to make a decision. Minister for Defense Avigdor Liberman who could not stop grinning! Singapore being a land scarce and resource poor country without any strategic depth has always looked to a doctrine of maintaining a qualitative edge against its regional peers to overcome these inherent disadvantages. Over the past few decades, the RSAF has seen its traditional lead over its rivals shrink dramatically with the introduction of Russian Su-27 / Su-30 Flanker family multirole fighters in the region. Both Indonesia and Malaysia have been operating these lethal fighters for several years. 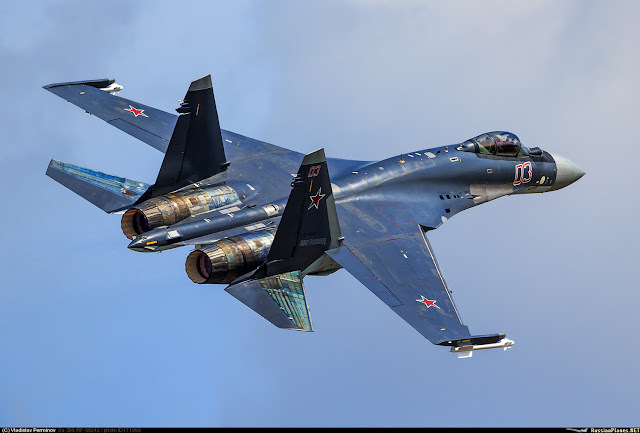 In addition, Indonesia is in advance negotiation with Russia to acquire eight Su-35 Super Flankers. 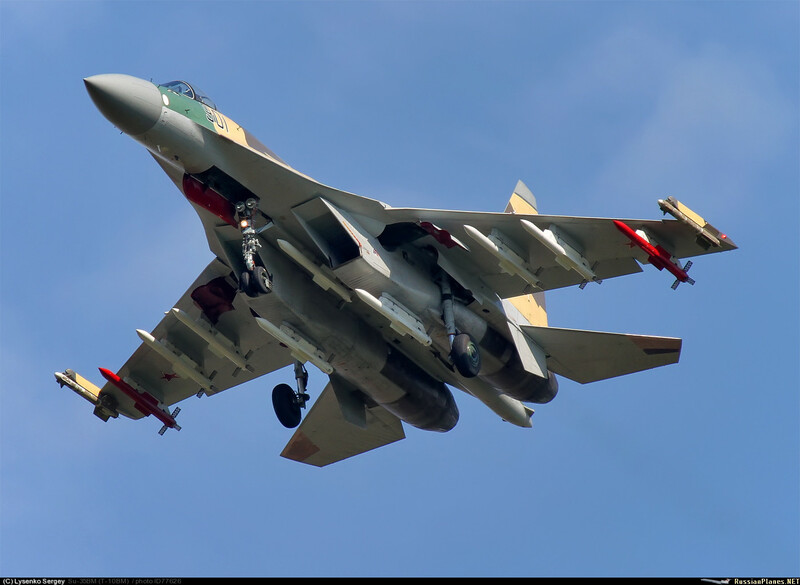 Further away, both Vietnam and China have large Flanker fleets, with China already committed to buying 24 Su-35 with the first 4 deliveries expected this year. The RSAF's F-16C/D and F-15SG will find it challenging to match the superior performance of these advance Flankers. Hence, the impending introduction of the all new Su-35 as well as the continued threats from existing Flanker types might just be the catalyst to induce Singapore to finally stop mulling about the F-35 and actually buy it. The Sukhoi Su-35S Super Flanker of the Russian Air Force. The Su-35 could carry a total of twelve air-to-air missiles. The aft centerline pylon is empty in this photo. Credit on Image. Whoever said that the F-35 acquisition had to be a replacement for an obsolete aircraft type? Of course ageing aircrafts have to be replaced in a timely manner so as to avoid any possible capability gaps from occurring during the transition. Right now the 27 F-5S and 9 F5Ts already have their days numbered. But how about getting a squadron of the short take-off and vertical landing ( STOVL ) F-35B as a new capability for the RSAF? The F-35B is currently the only modern fighter aircraft in production that has STOVL capabilities. The proliferation of advance long range saturation rocket artillery systems like the Avibras ASTROS II within the regional armies of Malaysia and now Indonesia meant that there could always be a threat that Singapore's airbases and runways could be targeted from outside its boundaries during outbreaks of hostilities. Having even a small number of STOVL capable fighters dispersed in various well concealed locations will ensure at least some aerial defense and retaliatory options while runway operations are temporarily disrupted. In addition, should the Navy eventually replace its four Endurance-class Landing Platform Dock with the Joint Multi-Mission Vessel ( JMMS ) which is essentially a helicopter carrier, it would not be inconceivable to build them large enough to accommodate the F-35B, although it could be at the expense of a reduced shore projection capability. That would provide serious close air support to any amphibious landing force and top cover for the naval task force. As a whole, the F-35 Program has made significant progress especially in the past few years. Although still far from complete, many milestones have been achieved. But the ultimate milestone would be the attainment of the Initial Operational Capability ( IOC ). The F-35B of the USMC was the first to declare operational on 31st Jul 2015. Slightly more than a week ago on 2nd Aug 2016, the USAF also declared that the F-35A is combat ready. We are now left with the Navy's F-35C which will be projected to achieve IOC sometime between Aug 2018 and Feb 2019. Since nobody except the US intends to buy the F-35C, as far as export customers are concerned, the F-35 can be considered combat ready. Singapore's Minister for Defense Dr Ng Eng Hen had expressed satisfaction that the JSF Program is progressing well when he visited the F-35 Academic Training Center at Luke Air Force Base and received a briefing on the F-35's capabilities from the 61st Fighter Squadron in Dec 2015. Over the years, he had witnessed the hangars at the air base gradually fill up with F-35 fighters. He could also see the F-35 chalking up on sortie numbers and flight hours. From Dec 2006 to May 2016, the F-35 fleet has a combined total of nearly 60000 flight hours. By Oct 2015, 162 F-35s had been delivered to the Department of Defense ( DOD ), inclusive of the 20 SDD test aircrafts. Lockheed Martin's Fort Worth facility is now churning out Low Rate Initial Production ( LRIP ) Lot 8 aircrafts. There will be at least another three lots of LRIP till Lot 11. The more mature a program is, the less risk it would present to the countries who are adopting it. So the JSF program has more or less matured, though eight years later than initially projected. Maryland. Photo taken on 18th Feb 2012 Lockheed Martin. After years of runaway escalation, the trend had finally reversed and unit cost of all three variants of the F-35 continues to drop a little year by year as Lockheed Martin has been able to reduce the number of labour hours required to produce an F-35 from 153000 hours per aircraft in 2011 down to 50000 hours by mid-2015, all thanks to efficiency gains and process improvements ( see photo of the EMAS below ). As a result, the unit cost of the cheapest and most commonly procured F-35A variant could fall to $80 to $85 million for an F-35 ordered in 2018 and delivered in 2020. At this price, the F-35A could even be cheaper than modernized versions of some high end legacy fighters. For comparison, Lockheed Martin's own F-16 V Viper is estimated to cost $60 million per copy, while Boeing's F-15SE Silent Eagle which has some stealth features like radar absorbent coating and conformal weapon bays can cost more than $120 million. Singapore's initial tranche of 12 F-15SG, ordered in Dec 2005, was estimated to cost about $1 billion. So the unit cost could be about $83 million or more, and that was more than a decade ago. A full-rate production Eurofighter Typhoon costs $119 million, the Rafale-B $98 million, the F/A-18E Super Hornet Block II $78 million and even the SAAB JAS-39C Gripen ( no AESA radar ) cost $69 million. For FY2016 though, the unit cost of F-35A is $109.88 million, the F-35B at $121.33 million and the F-35C at $117.83 million, already on par with the F-15SE. Electronic Mate And Assembly System or EMAS. The twelve Alenia Aermacchi M-346 Master lead-in to fighter trainers of the RSAF's 150 Squadron acquired in 2012 are specifically designed for helping trainee pilots transit from advance jet trainers to operational conversion with 5th generation jets like the F-35. They can simulate the flight characteristics of the F-35 and can even be used as companion trainers to reduce the need for pilots to fly the F-35 to maintain their combat readiness. They are F-35 and future-proofed. Their earlier acquisition fits into the grand scheme of possible F-35 buys down the road. 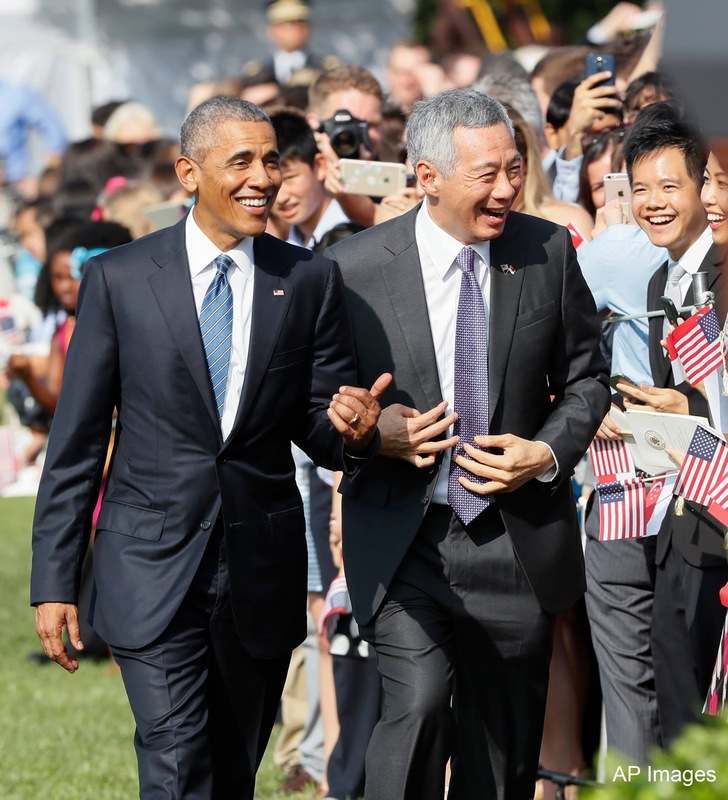 In the joint statement released by the governments of the United States and Singapore after the meeting at the Oval Office between President Obama and PM Lee, it was mentioned that " President Obama welcomed Singapore’s continued interest in the F-35 aircraft. The two leaders expressed support to explore new training opportunities for the Singapore Armed Forces in Guam, with an eye toward a potential long-term training detachment for the Republic of Singapore Air Force. " Since the late eighties, long term training detachments of the RSAF to the United States had always been associated with a Foreign Military Sale of some major platform, like the F-16 and the Peace Carvin II detachment to Luke Air Force Base ( AFB ), the F-15SG and the Peace Carvin V detachment to Mountain Home AFB, the CH-47D and the Peace Prairie detachment to Redmond Taylor Army Heliport ( AHP ), and the AH-64D and the Peace Vanguard detachment to Silverbell AHP. So is Singapore about to make another major arms acquisition? Perhaps but it might not be what you are thinking about. There are currently three major training centers for the F-35, Eglin AFB in Florida where the Integrated Training Center trains F-35 pilots and maintainers, Luke AFB in Arizona and MCAS Beaufort in South Carolina. All foreign ( and many US ) pilots of the F-35A are currently being trained at Luke AFB where 6 squadrons ( 144 aircrafts ) of F-35As comprising a mix of USAF and pooled FMS assets will eventually be available. F-35B pilots are trained at Marine Corps Air Station ( MCAS ) Beaufort, home of Marine Fighter Attack Training Squadron 501 ( VMFAT-501 ). This is also where UK and Italian F-35B pilots would receive their training. 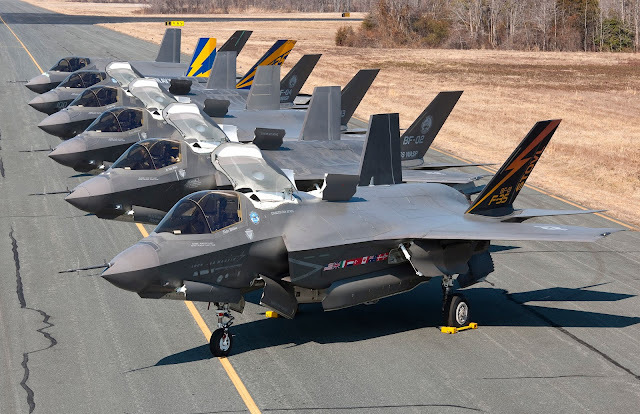 Depending on the variant selected, a F-35A buy would probably mean another Peace detachment to Luke AFB while a F-35B buy would necessitate a detachment to MCAS Beaufort. 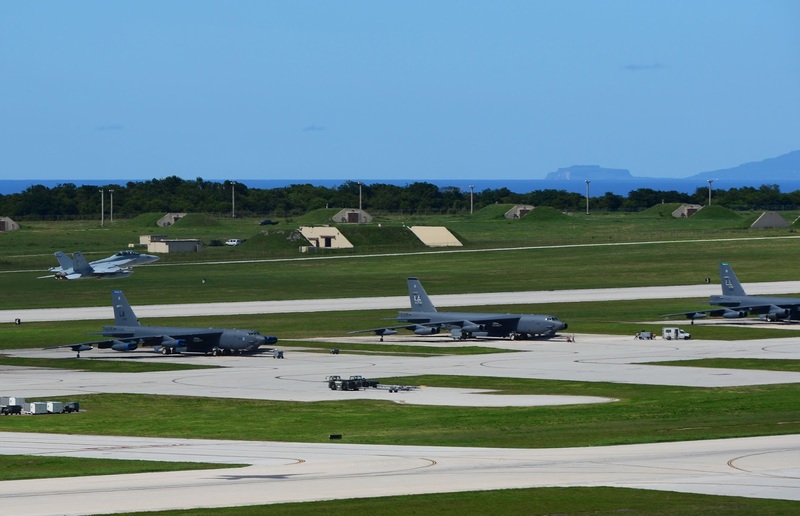 There ain't no F-35 simulators on Guam! Therefore, we know for sure that the F-35 was part of the agenda of that meeting, otherwise it would not have been referred to in the joint statement. 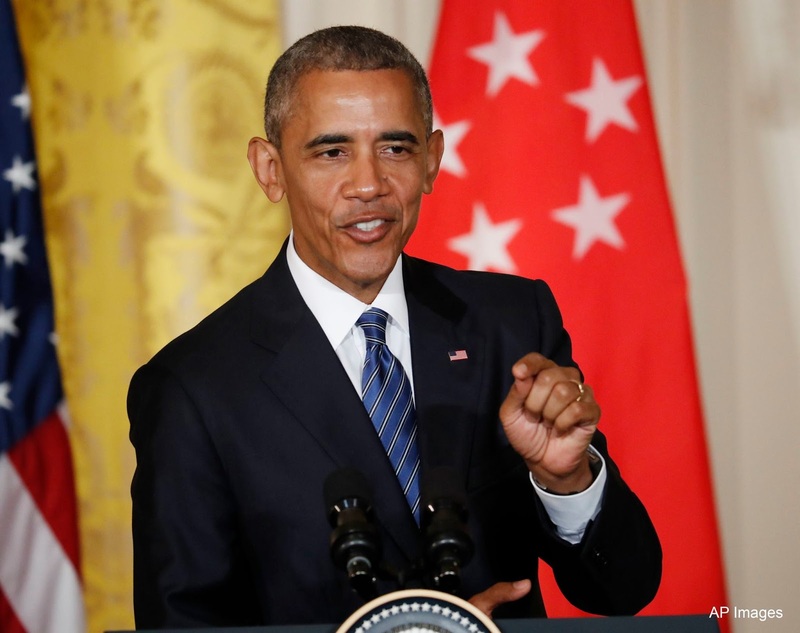 Obama must have asked Singapore to consider buying the F-35, again. Unfortunately, despite the favourable factors for the F-35, the answer was no .... for now. Hence, the statement about continued interest. Indeed, a news report by Bloomberg two days ago said that in Dec 2014 Singapore had submitted a letter of request to the US formally seeking information on the purchase of the F-35. It then followed up in early 2015 with indications that it wanted the STOVL F-35B variant, the most complicated model. The initial acquisition was intended to be for four aircrafts by 2022 with options for another 8 more. Earlier this year, the US even gave the approval for Singapore to integrate its own radio and datalink into the aircraft should it be purchased. 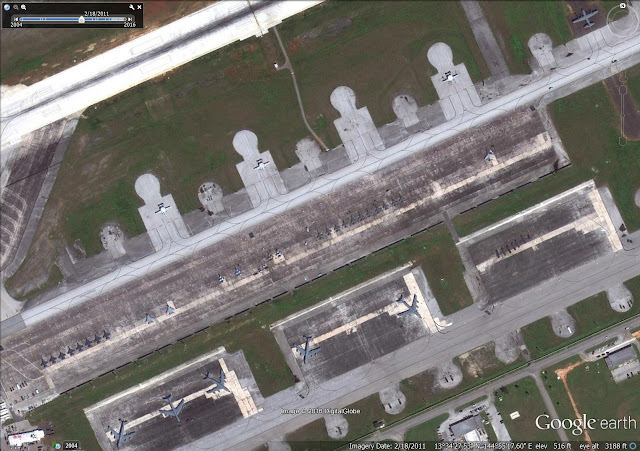 However, for reasons yet not known, Singapore had informed the US in June this year that the purchase was now on hold. You can see here what IHS Jane's had to say in this video published on 8th Aug 2016 on the F-35 and Singapore. The hovering / vertical landing F-35B seen at MCAS Beaufort has a RAF roundel and belongs to the UK, a first tier partner in the JSF Program. Some nice clips of the F-15SG and F-16C are included. The narration department has much to be desired, though. Where In The World Is Guam? Guam is a US Territory in the Northwestern Pacific. 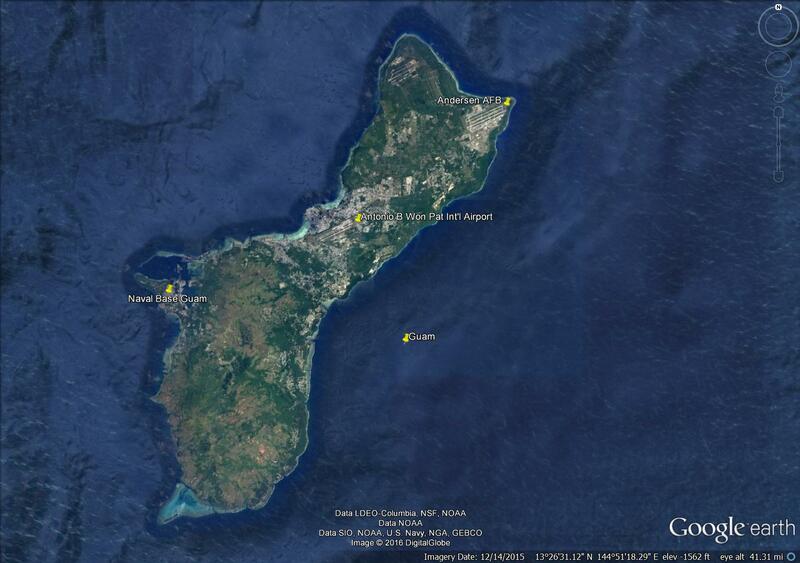 Saipan and Tinian, all famous battlegrounds in the Pacific War. The B-29 that dropped the atomic bomb on Hiroshima launched from Tinian. Guam is an American territory located in the northwestern Pacific Ocean. 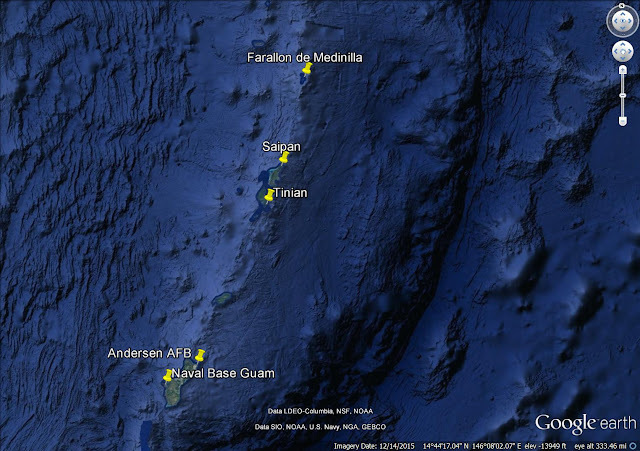 It is the largest and the southernmost of the Marianas Islands. Its strategic value lies in the fact that it is a US owned territory midway between Hawaii and Asia and therefore an important forward deployment, transit and logistic hub for the USAF and the USN, playing a key role in Obama's Rebalance to Asia. 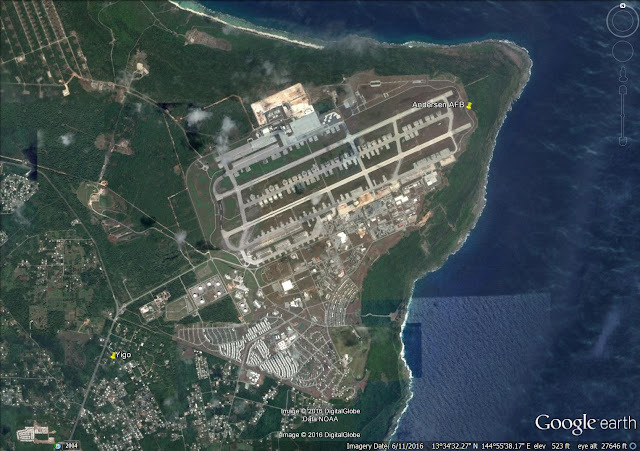 It has two major military bases - Naval Base Guam and Andersen Air Force Base, now managed together as Joint Region Marianas. Joint Region Marianas Logo from its Twitter site. 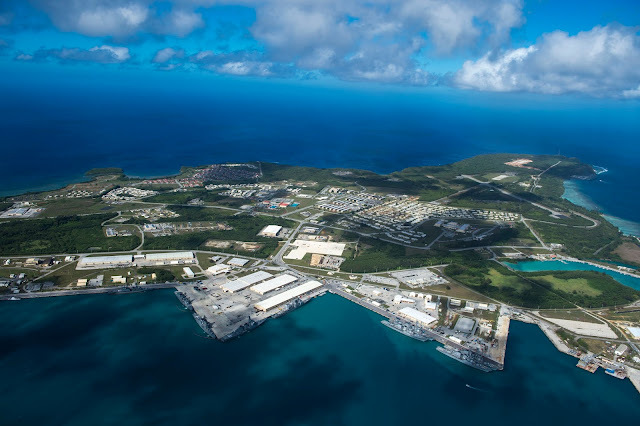 Naval Base Guam at Apra Harbor, Santa Rita is the home of Submarine Squadron 15 made up of several Los Angeles-class nuclear attack submarines. It is also the home port of many Pacific Fleet units and US Coast Guard units. 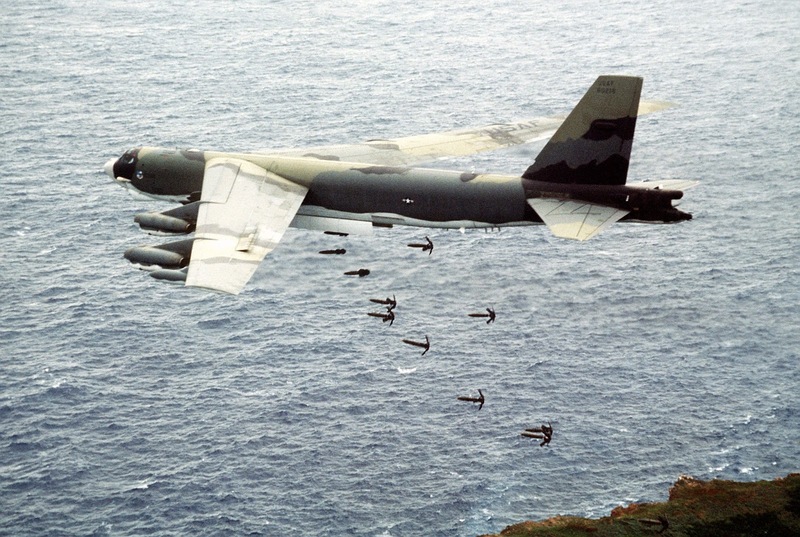 Andersen AFB on the other hand, is one of four bomber forward operating locations of the USAF, providing support to rotating forward deployed strategic bombers like the Boeing B-52H. Proximity to the naval bombing range at Farallon de Medinilla Island 296km north of Andersen and the vastness of the surrounding air space makes Guam an ideal training place for these huge aircrafts. Beginning 2019, Guam will be receiving some 5000 marines and 1300 of their family members relocated from Okinawa, where the Okinawans had found them burdensome. The build up will continue to 2026. Only a third will be permanently based there while the rest will train there on a rotational and staggered basis. Many will be housed around the vicinity of Andersen AFB where some of the training ranges are also located. Ex Polar Lightning 12th Mar 2009. USAF Photo. during Ex Valiant Shield 14th Sep 2014. USN Photo. 5th Mar 2016. Several warships can be seen berthed in the foreground. USN Photo. So What's The Deal With Guam? 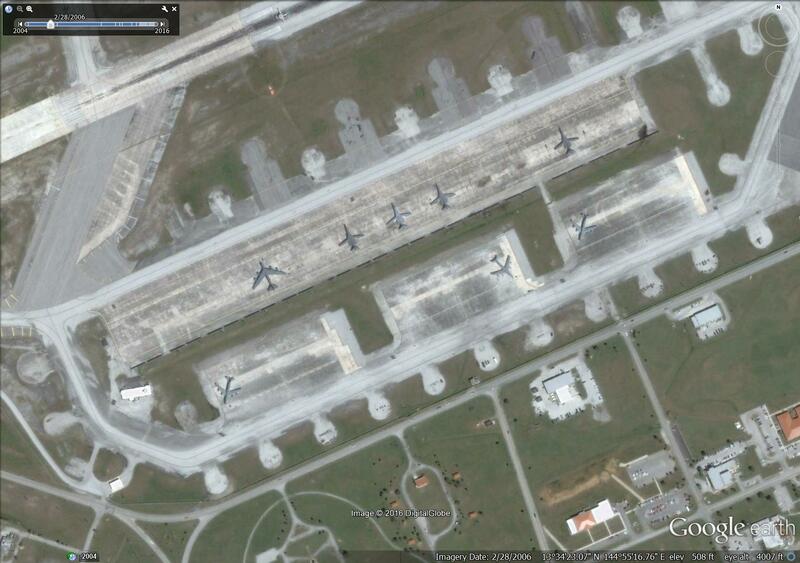 The proposed long term training detachment of the RSAF to Guam probably has nothing to do with FMS this time. Its not the F-35 for sure. 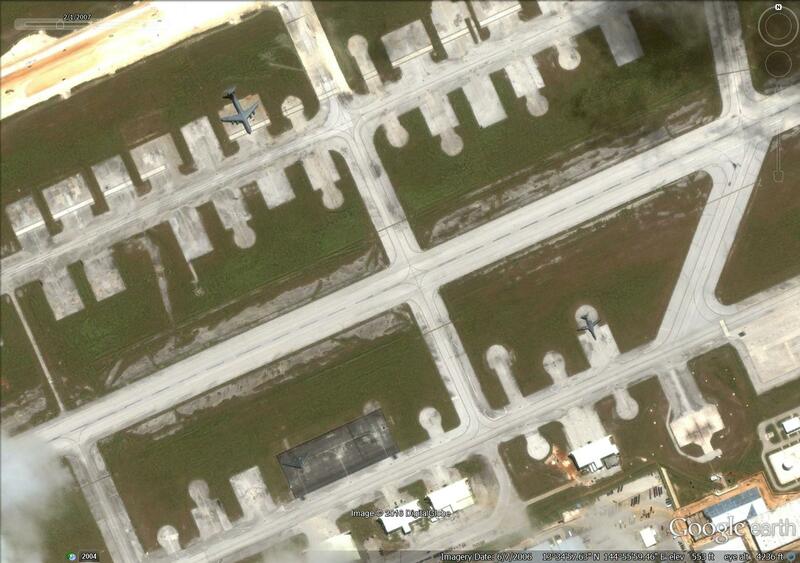 Its not the P-8 as the detachment should have gone to Naval Air Station Jacksonville, Florida, otherwise. I believe the motive for the detachment to Guam is far more mundane. It is most likely a relocation of the Peace Carvin II F-16 detachment at Luke AFB to a venue closer to Singapore. 28th Oct 2013. USAF Photo. 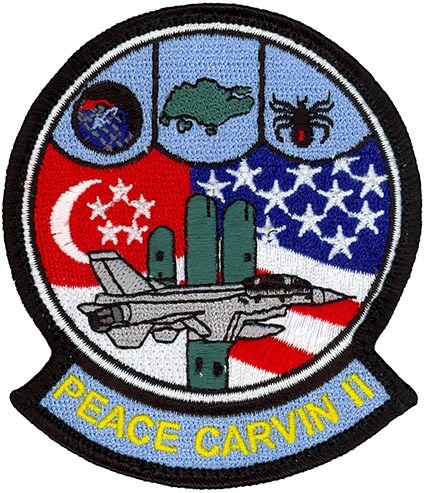 The Peace Carvin II detachment to Luke AFB was Singapore's first permanent training detachment to the US. It started in 1993 and marked its 20th anniversary in 2013. It is also Singapore's longest running foreign military training detachment. The contract for the program had been renewed several times and unless further renewed will expire in 2018. With the F-16 gradually becoming obsolete and Luke AFB slowly transiting to become the premier F-35A training base just like it did with the F-16 35 years ago, it might not make a lot of sen$e to extend the Peace Carvin II program further. 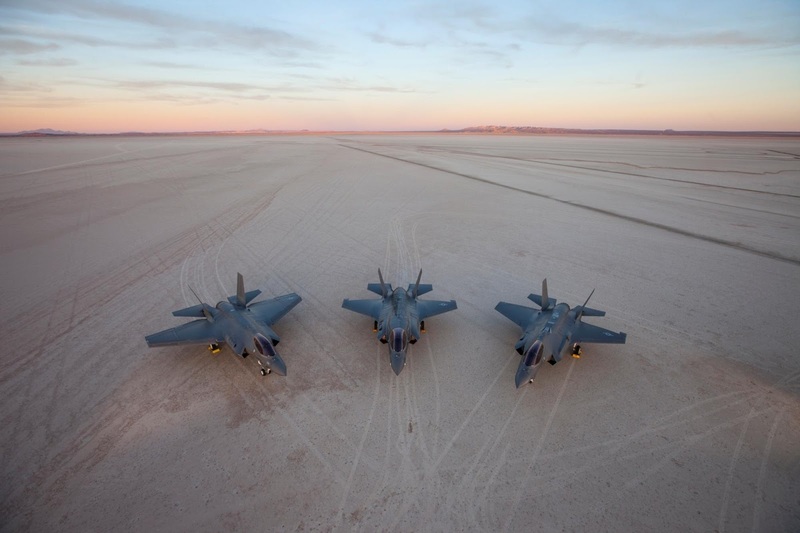 Even if Singapore had requested for an extension, the US may not necessary grant it this time as they focus on ramping up F-35A numbers and training at Luke AFB. The Peace Carvin II Patch : Saguaro ( AZ ) and Blackwidow ( 425th ). Bringing home the F-16 squadron doesn't sound appealing as Singapore lacks the air space for these fast jets to train and maneuver. Relocating the squadron to a USAF base somewhere else would be a better idea, since the F-16 pilots will continue to benefit from the training and exposure, especially with regards to large scale multi-national exercises like Ex Valiant Shield. 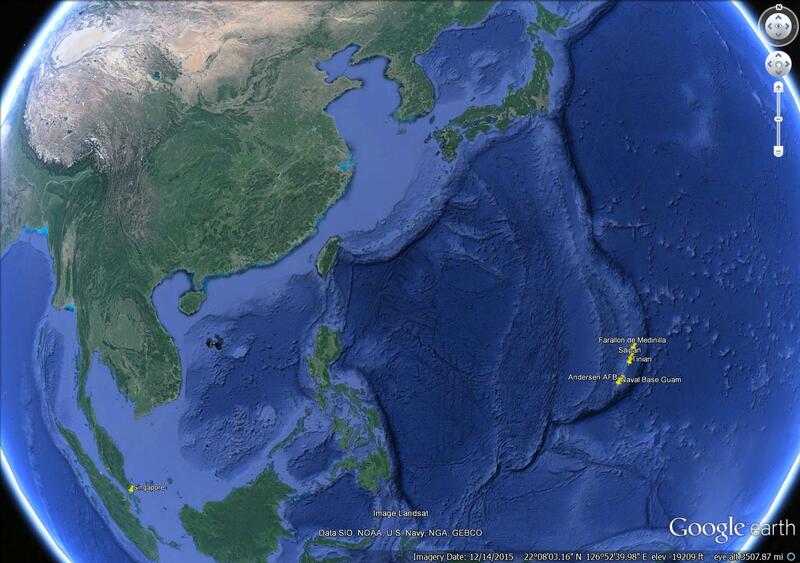 And when you look at the map, the nearest US air base to Singapore is Andersen AFB in Guam. Basing the F-16 in Guam has advantages apart from the vastness of the airspace and the proximity of the naval bombing range. The logistics will be easier and cheaper to handle and the aircrafts could be recalled back to Singapore much faster should the need ever arise. Andersen AFB is 4717km from Paya Lebar Air Base in Singapore which is just slightly more than the maximum ferry range of a Block 50/52 F-16 with external drop tanks. This distance is still far but much less formidable compared with the distance to the US. We often forget how BIG the Pacific Ocean is and how far it is from America to Asia. 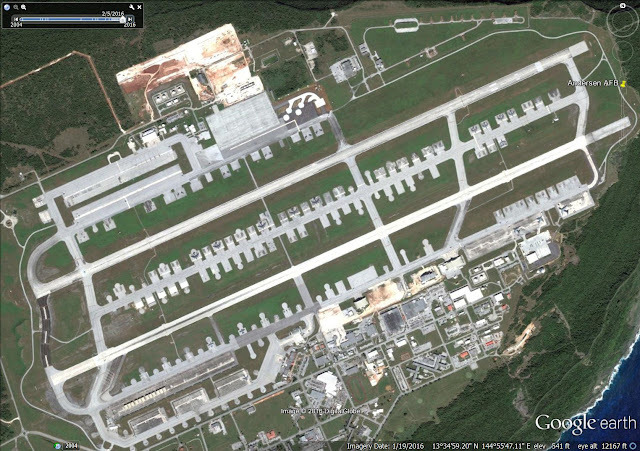 From Andersen AFB to Hickham AFB in Hawaii is 6096km. Hickham to Luke AFB is another 4663km. The great circle distance from Paya Lebar Air Base to Luke AFB is 14606km. A previous recall exercise saw the F-16s hopping from one AFB to another across the Pacific, requiring six aerial refueling and six full days to complete the journey. Geographical location of Guam and Singapore. The 250 RSAF personnel and their family members of the training detachment hopefully will not be too much of a burden to the increasingly congested Guam Island as the Marines move in from Okinawa. But one thing is for sure. It will be a mini boost to the local economy for years to come, just like what the SAF brought to the Australian township of Rockhampton with its training at Shoalwater Bay, Queensland. Luke's loss will be Guam's gain. It has been said by Mr Lee Hsien Loong during his state dinner toast remarks that much could be achieved even by lame duck presidents during their final months in office, like Bill Clinton and the US-Singapore Free Trade Agreement, signed after a midnight round of golf with then Singapore Prime Minister Goh Chok Tong on a rainy night in Brunei during an APEC summit. For President Obama though, there will be no F-35 sale to Singapore for now to add to his legacy as the first black president of the United States. That honor will probably go to the next president, hopefully not Mr. Donald Duck who may be just lame from day one. Indonesia and Malaysia would probably breathe sighs of relief knowing that Singapore had postponed the F-35 acquisition. But the delay will only be as long as needed. The restrain will go should more Flankers or advance air defense systems populate the region. President Obama and PM Lee on 4th Aug 2016, Obama's birthday. I used to be verrry interested in planes, like the KC-135s which flew over our school in the 3rd grade... yet, now I realize their all pawns used by the OWG/George Sorrows to control the human population which has grown too big. Aren't YOU yourself in humanity, too? While I realize also you can do nthn to stop the depopulation of our country, thar is somethn you can do: think about your demise, friend. 1-outta-1 croaks, dude. And if you dont have Jesus in your wee, wee existence, I fear for thy indelible soul. Thank you. And may God bless the F-35 too!